This white stone building has a wide doorstep, even though these doors open inward. 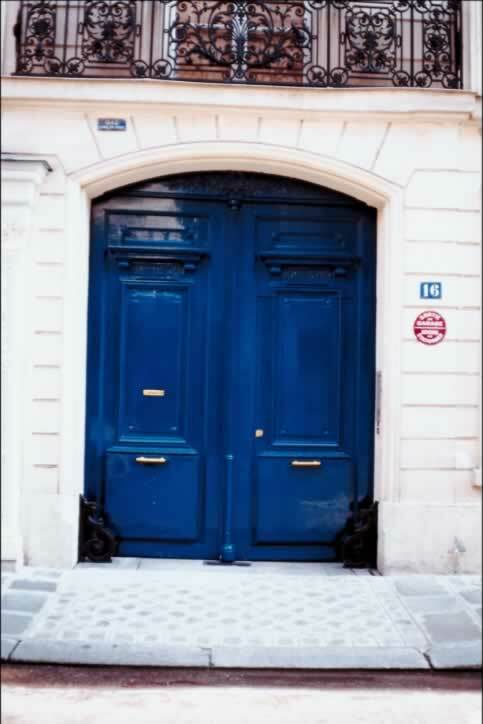 These large double exterior doors are a three-panel design. Although the doorway itself is an elliptical arch, the doors are not. The top most panel of the door has a piece of horizontal molding affixed with two round spheres below the molding on either end. The middle panel of each door is the biggest, and the bottom panel is raised. Each door has a door bar handle mounted horizontally at the top of the bottom panel, which seems very awkward, even though these doors open inward. The left door has a door plate affixed; door plates are typically used to communicate something to visitors, such as "push" or "no smoking." Additional hardware includes wrought iron guards that are mounted to the sill of each door and match the balcony's railing above the doors.